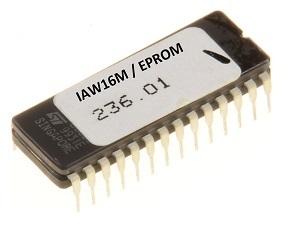 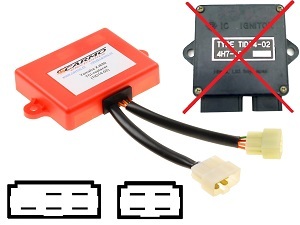 Improved replacer for California 3 Dyna ignition * Printboard replacer, please send the original unit to Carmo *. 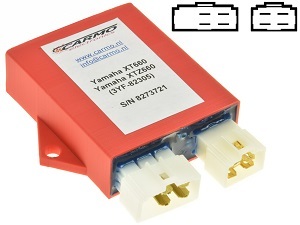 Your Motorbike will perform better.. 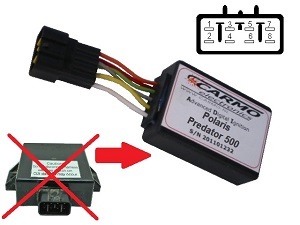 Improved Polaris Predator 500 CDI box. 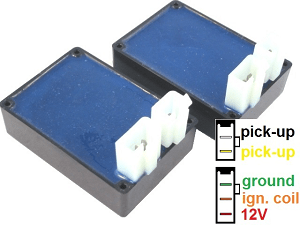 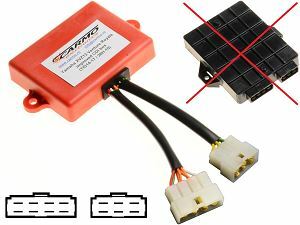 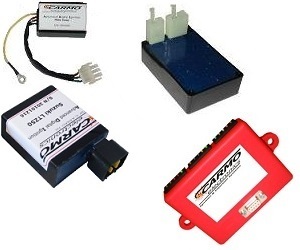 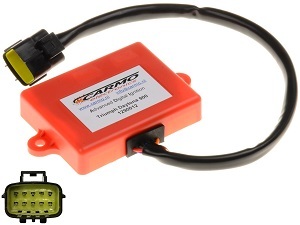 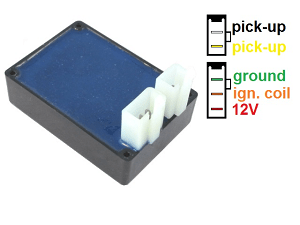 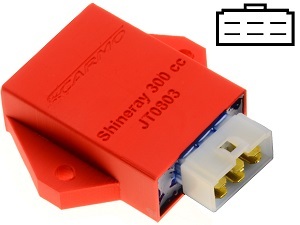 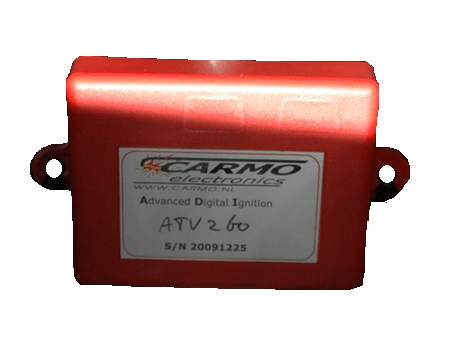 Your Quad will perform better with this advanced ignition unit from Carmo electronics! 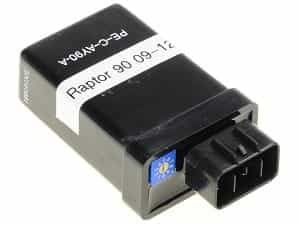 It will give more speed. 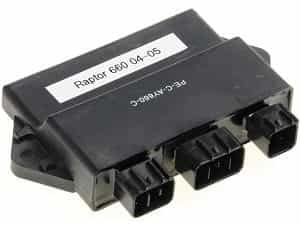 This a redesigned CDI unit of the Yamaha Raptor 90. 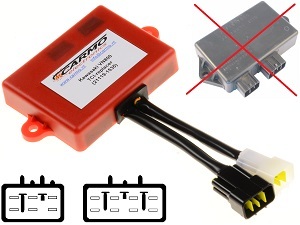 This unit is provided with our best re-mapped built-in timing curve. 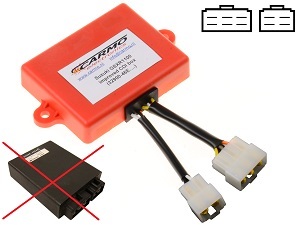 This adds more horsepower to. 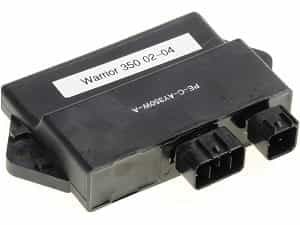 This a redesigned CDI unit of the Yamaha Warrior 350. 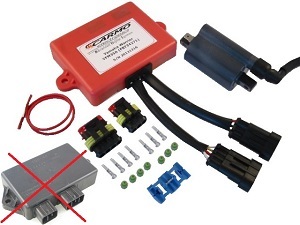 This unit is provided with our best re-mapped built-in timing curve. This adds more horsepower.. 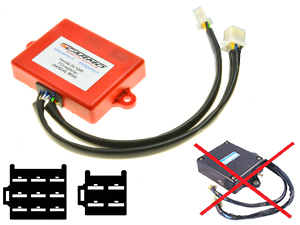 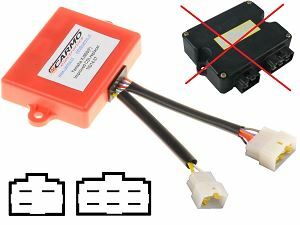 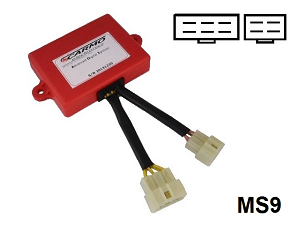 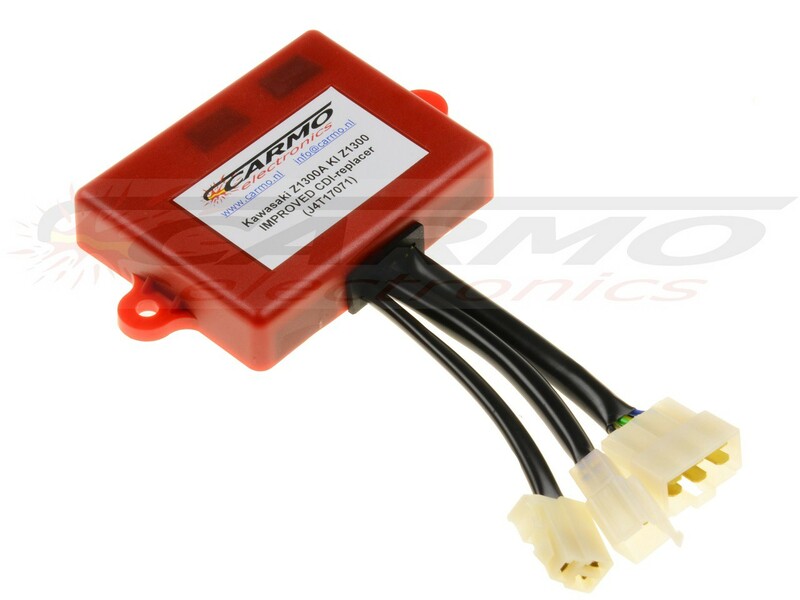 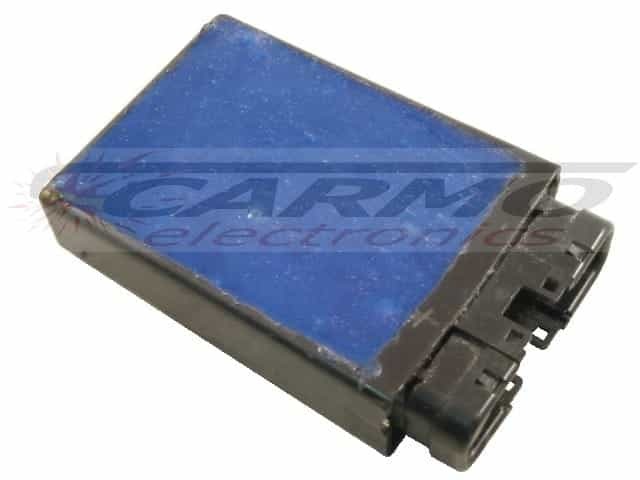 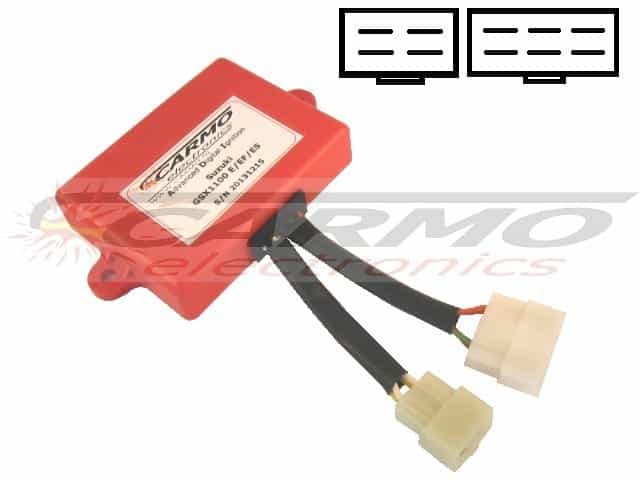 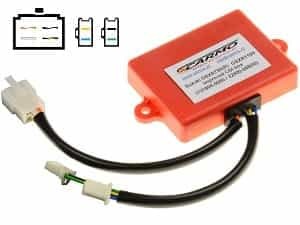 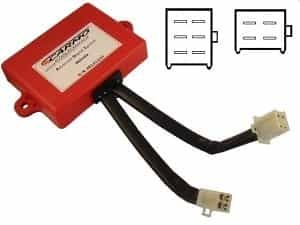 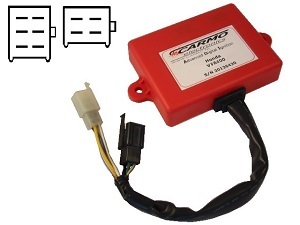 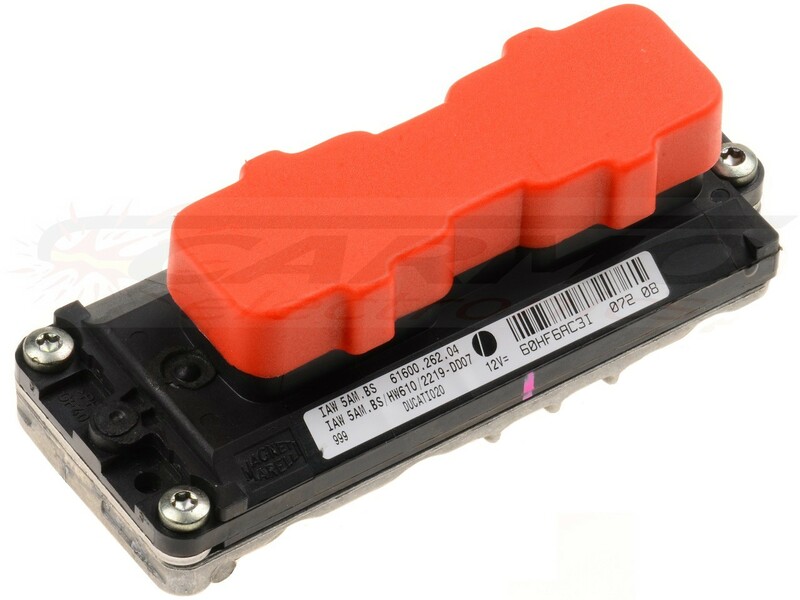 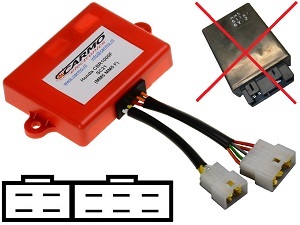 Improved CARCD19001 CDI-box MC-5194 OKI MPS200 Your bike will perform better with this advanced ignition unit from Carmo electronics! 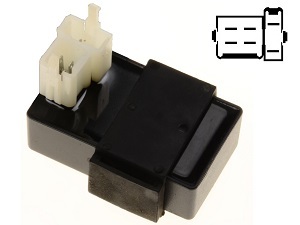 *Plug and Play*. 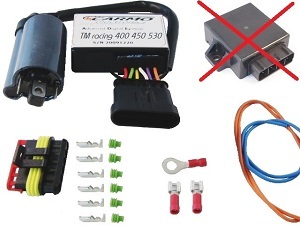 Improved TM racing 400 450 530 CDI ignition set 3 Year warranty for: TM racing 400 CDI igniter TM racing 450 CDI igniter TM racing 530EN 4-stroke CDI. Improved Digital Moto Guzzi Motoplat CDI-unit 3 Year warranty Plug and Play Your bike will perform better with this advanced ignition unit from Carmo. Improved Suzuki Arctic Cat 32900-19B40 32900-19B50 CDI-set. 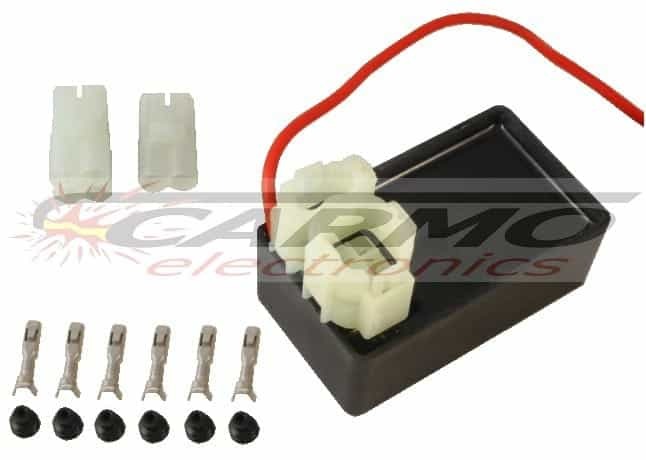 070000-2490 / 070000-2500 3 Year warranty For: Arctic Cat 250 CDI igniter set Arctic Cat.. 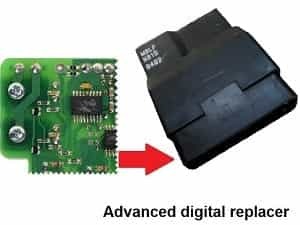 Improved Honda NTV650 Deauville CDI Replacer For this price Carmo replaces the entire board of your unit by a new advanced version. 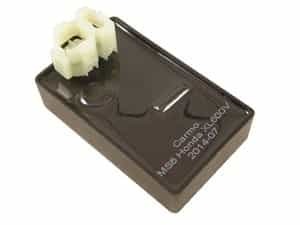 You have to send.. 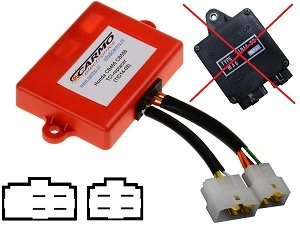 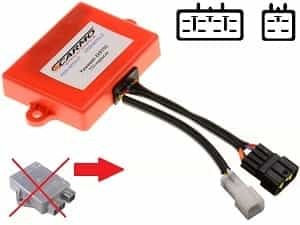 Improved Xinyang XY500 CFMOTO CDI-unit Plug&Play 3 Year warranty Your dune buggy will perform better with this advanced ignition unit from Carmo.. 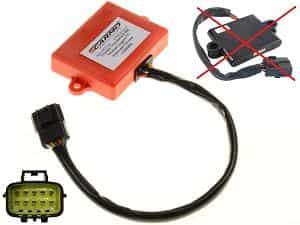 Improved Digital Moto Guzzi Motoplat CDI-unit (2X) 3 Year warranty Plug and Play Your bike will perform better with this advanced ignition unit from.. 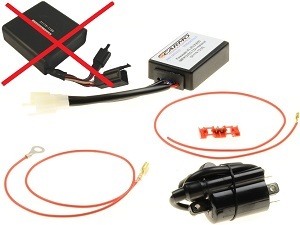 Improved Moto Guzzi California III Motoplat CDI-box Plug&Play 3 Year warranty Your bike will perform better with this advanced ignition unit from. 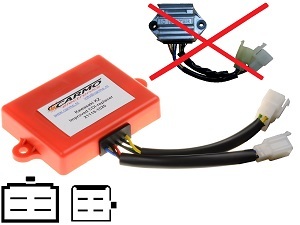 Improved Motoplat CDI-unit for a Moto Guzzi V65 Florida Plug&Play 3 Year warranty Your bike will perform better with this advanced ignition unit..
Polaris 335 400 425 500 improved CDI ignition set High performance! 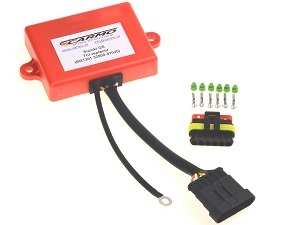 Powerfull spark because of battrery DC as source 3 Year warranty For: Polaris Big. 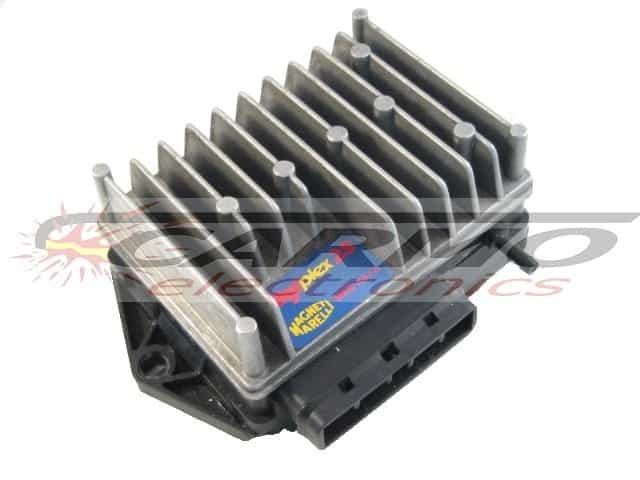 Unilli Eagle Xtreme Pro Reverse 150cc 155cc improved CDI Unit set (4CW-10) High performance! 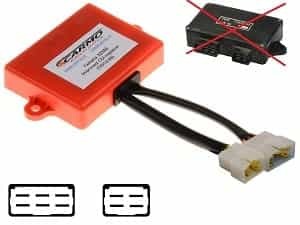 Powerfull spark because of battrery DC as source 3 Year.. 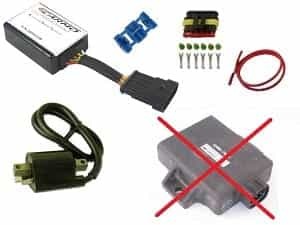 Improved Yamaha V-Max 1200 Vmax VMX12 VMX1200 CDI igniter BB7224 Full power version 3 Year warranty Plug&Play For: Yamaha V-Max 1200 CDI igniter.. 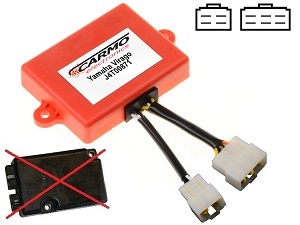 Improved Yamaha XV535 Virago CDI igniter J4T033 Full power version 3 Year warranty Plug&Play For: Yamaha XV535 Virago CDI igniter 1992 1993 1994.. 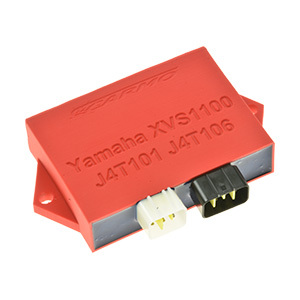 Improved Yamaha XVZ1200 Venture Royal Star CDI igniter TID14-28 Full power version 3 Year warranty Plug&Play For: Yamaha Venture Royale (47G) CDI. 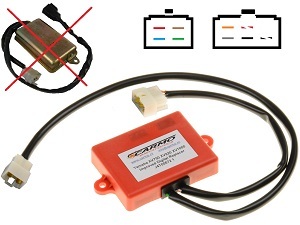 Improved Yamaha XVZ1300 Replacer unit TID14-28, TID14-94, TID14-17 TID14-34, J4T063, J4T083 Your bike will perform better with this advanced ignition. 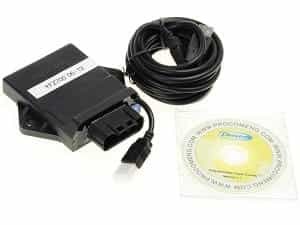 Yamaha YFM350 Warrior CDI igniter (3GD-40) Improved full version 3 Year warranty For: Yamaha YFM350 Warrior CDI igniter 1997 1998 1999 2000 2001 OEM.. 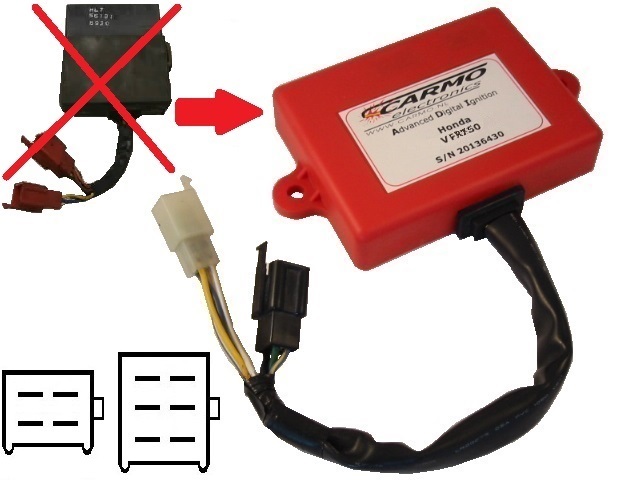 Improved BB1105 BB1105A BB1132 CDI TCI-unit 3 year warranty Plug & Play Your bike will perform better with this advanced ignition unit from Carmo. 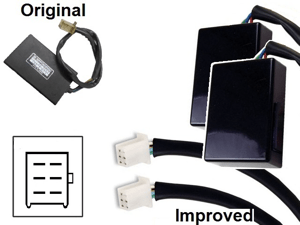 Improved Honda CB550 CB650 Nighthawk CDI Replacer AKBZ16 Plug&Play For: Honda CB550SC Nighthawk CDI Honda CB650SC Nighthawk CDI Honda CBX650E CDI. 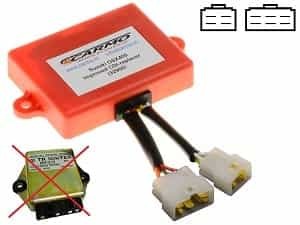 Improved Honda CB650 CB650SC RC13 CDI Replacer For: Honda CB650 RC13 CDI Honda CB650SC RC13 CDI 1983 1984 1985 OEM number: 30400-ME5-014 30400ME5014.. 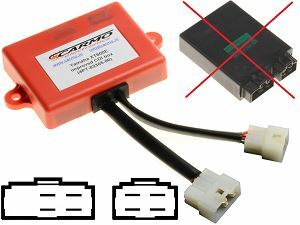 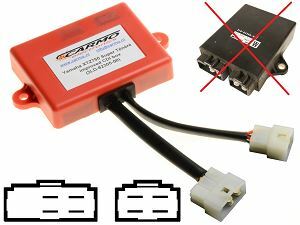 Improved Honda CBR400 RR (NC23) CDI Replacer Plug&Play Derestrict CDI, no limitation! 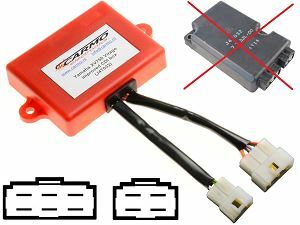 For: Honda CBR400RR NC23 CDI Honda CBR400R NC23 CDI On the.. 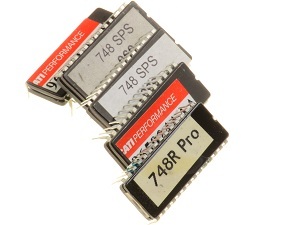 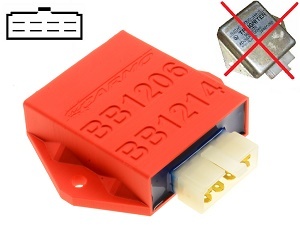 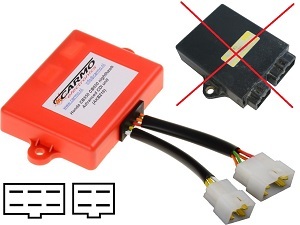 Improved Honda CBR750 CBR750F RC27 CDI Replacer (MM4, 511B1) Plug&Play For: Honda CBR750 CDI Honda CBR750 RC27 CDI Honda CBR750F CDI Honda CBR750. 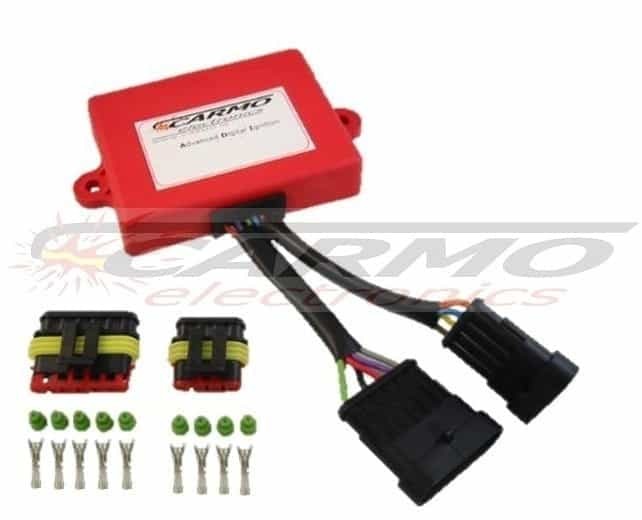 Improved Honda CBX1000 Prolink TCI (MR1) AMP Your bike will perform better with this advanced ignition unit from Carmo electronics! Improved version.. 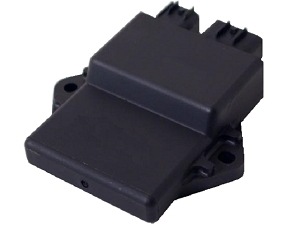 Improved Honda CB400 CBX550 CDI box For: Honda CMX400 Rebel CDI Honda CBX400 CDI Honda CBX400F CDI Honda CBX550 CDI Honda CBX550F CDI Honda CBX550F2.. 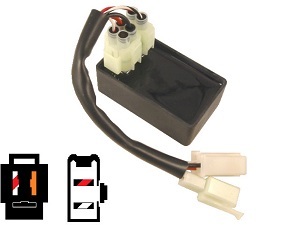 Improved Honda GL1200 CDI Replacer Plug&Play Suitable for: Honda GL1200 CDI Honda GL 1200 CDI Honda GL1200 Goldwing Interstate SC14 Honda GL1200.. 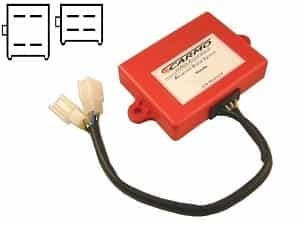 Improved Honda MPS200 TCI Replacer (AMP) Your bike will perform better with this advanced ignition unit from Carmo electronics! 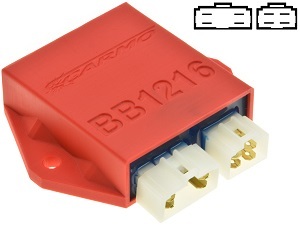 Improved version from. 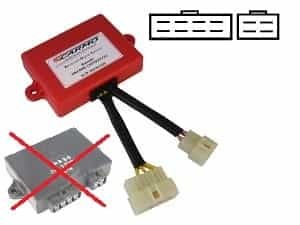 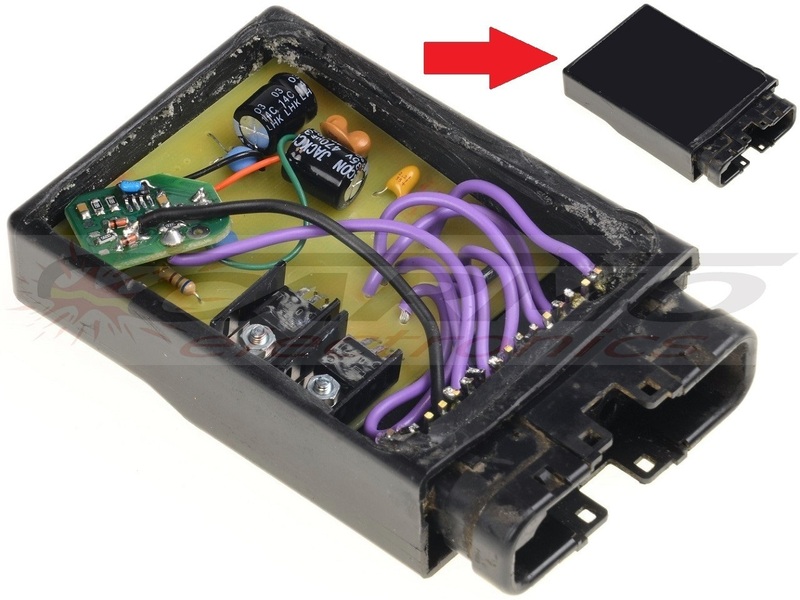 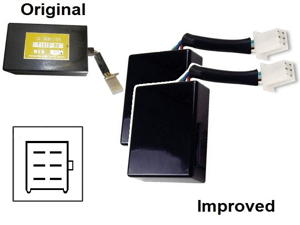 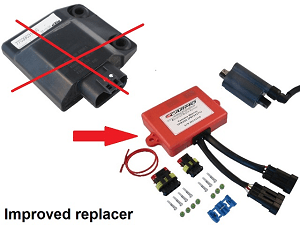 Improved Honda NTV650 Replacer Deauville (AMP) With superseal connectors You do not have to send your old unit, this is a full replacer. 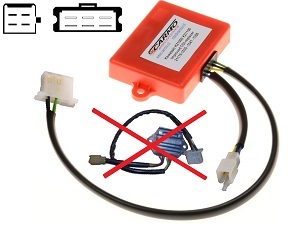 If your bike. 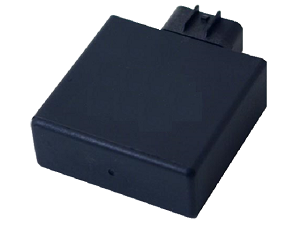 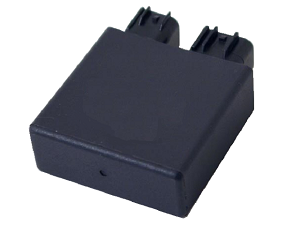 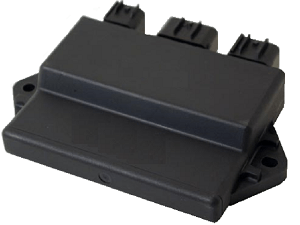 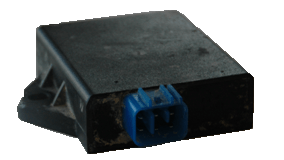 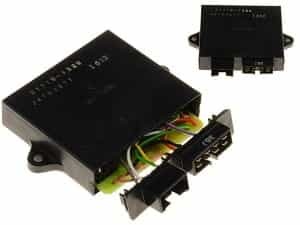 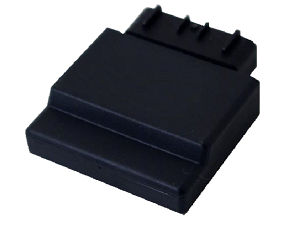 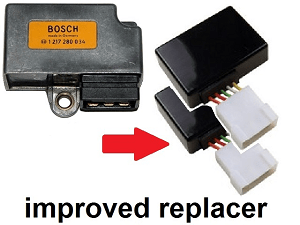 Improved Honda NV400 FT500 TCI Replacer AMP Unit numbers: - 131100-3550 - 131100-3551, AKBZ07 - 131100-3552, AKBZ07 - 131100-3553, AKBZ07 - MF5 Your.. 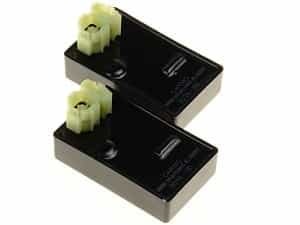 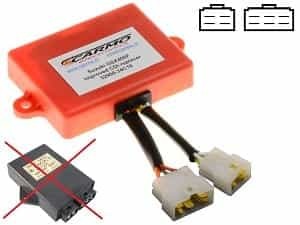 Improved Honda VT500 V30 TCI Replacer AMP (2x) Unit numbers: - 131100-3550 - 131100-3552 - 131100-3553 - MF5 Your bike will perform better with this.. 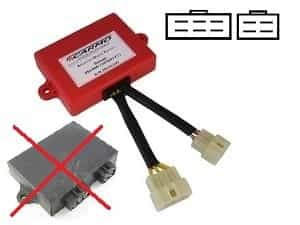 Improved Honda PC800 CDI Replacer (MR5) 3 Year warranty Plug&Play For: Honda PC800 Pacific coast RC24 CDI 1989 1990 1991 1992 1993 1994 1995 1996. 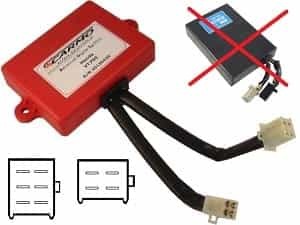 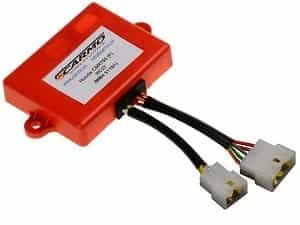 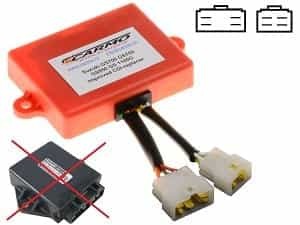 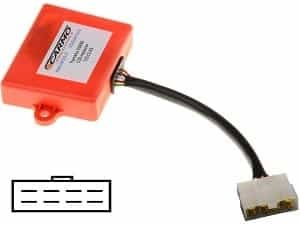 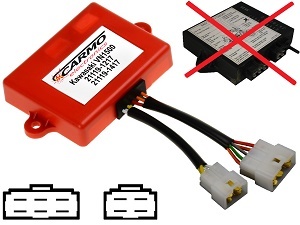 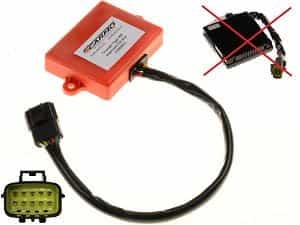 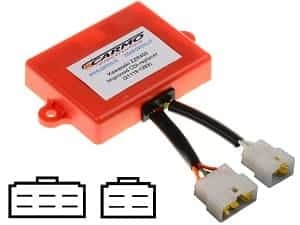 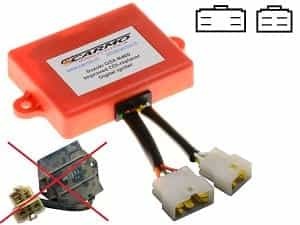 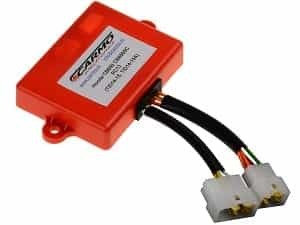 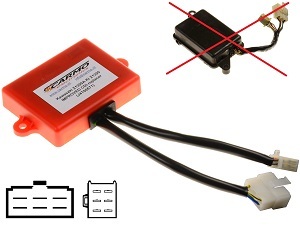 Improved Honda TRX400 TCI Replacer (HM7) AMP Your bike will perform better with this advanced ignition unit from Carmo electronics! 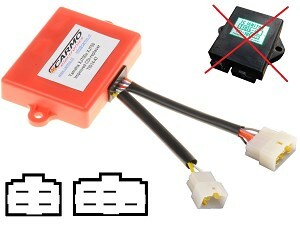 Improved version.. 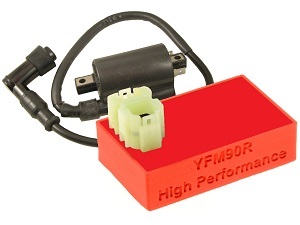 Improved Honda VF1000 CDI TCI Replacer AMP Plug&Play Suitable for: Honda VF1000 CDI Honda VF1000F (SC15) CDI Honda VF1000F Interceptor CDI Honda.. 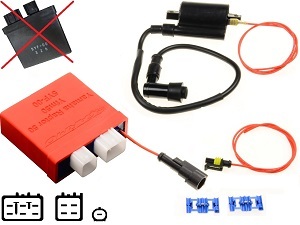 Improved Honda VF1100 TCI Replacer (MB4, TID12-13, TID12-13A) AMP Plug&Play For: Honda VF1000F (SC15) CDI Honda VF1100S (SC17) CDI Honda VF1100C..
2x Improved Honda VF700 VF750 CDI Replacer Plug&Play Suitable for: Honda VF700 Honda VF700 V40 magna Honda VF700 V45 Magna Honda VF700C V45 Magna. 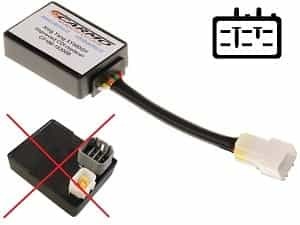 Improved Honda VFR750 RC24 CDI-box igniter ML7 ML7m 3 Year warranty Plug&Play For: Honda VFR750 CDI Honda VFR750 RC24 CDI 1986 1987 1988 1989 OEM. 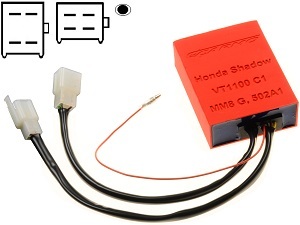 Improved Honda VT1100 C1 CDI ignition unit (MM8, 501C1, 501C2) 3 Year warranty PLUG&PLAY For: Honda VT1100C Shadow CDI Honda VT1100 C1 MM8, 501C1. 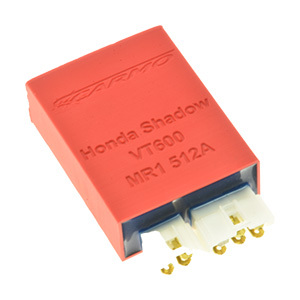 Improved Honda VT1100 C2 CDI Replacer (MAHA 502J) PLUG&PLAY 3 Year warranty For: Honda VT1100C Shadow CDI Honda VT1100 C2 MAHA, 502J OKI telecom.. 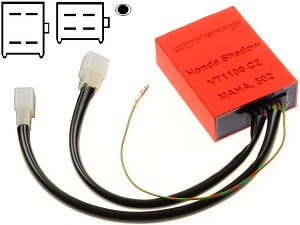 Improved Honda VT1100 CDI TCI Replacer (MG8, TID12-21) AMP Plug&Play OEM number: 30400-MG8-005 Honda VT1100C Shadow Hitachi IC IGNITOR Your bike.. 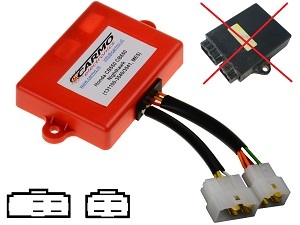 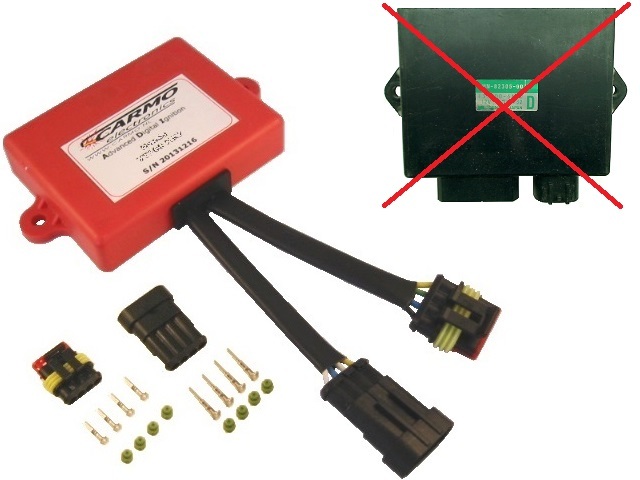 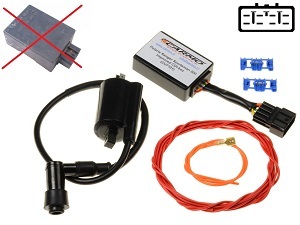 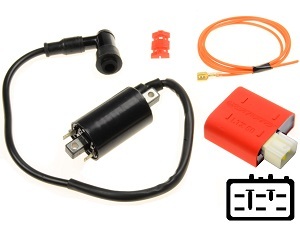 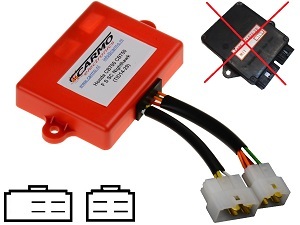 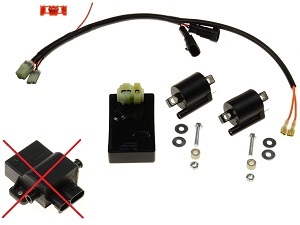 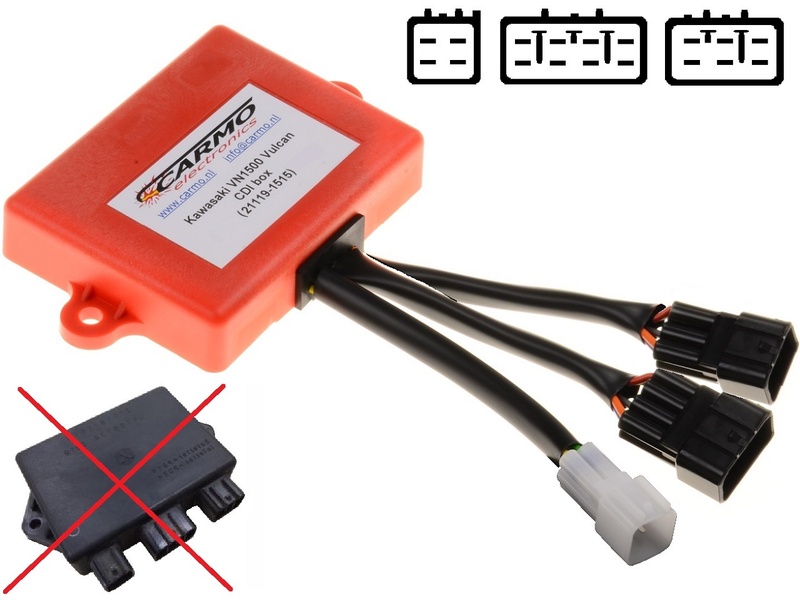 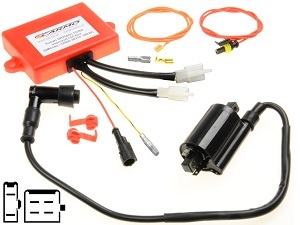 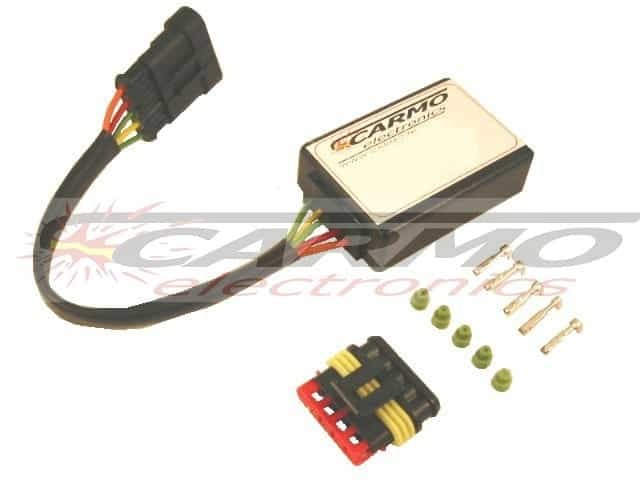 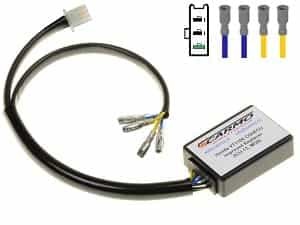 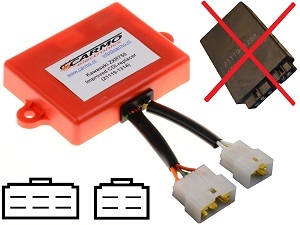 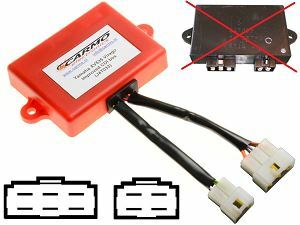 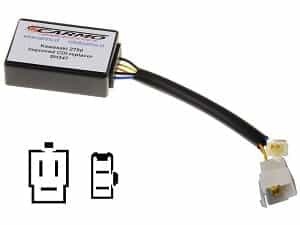 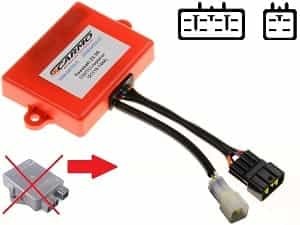 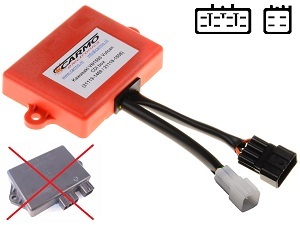 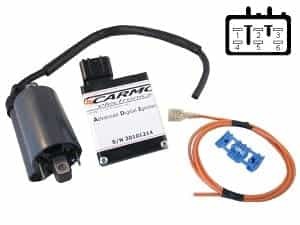 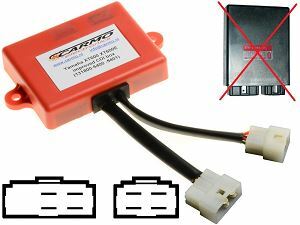 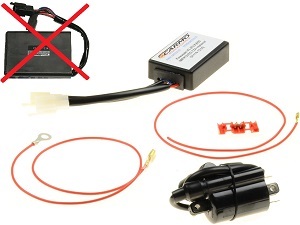 Improved Honda XLR125 TCI Replacer (AMP) Your bike will perform better with this advanced ignition unit from Carmo electronics! 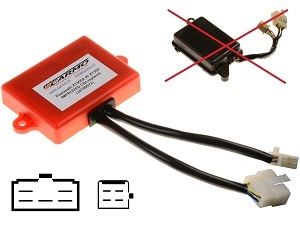 Improved version from. 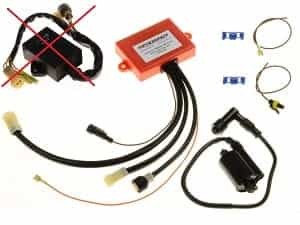 Improved Modern Bombardier Can AM Jawa 650 Rotax CDI igniter set (664 170, 071000-1910 Denso CDI) 3 Year warranty Your bike will perform better with.. Improved Kawasaki ER5 CDI Replacer J4T04378, 21119-1494 Plug&Play For: Kawasaki ER5 CDI Kawasaki ER-5 CDI Kawasaki ER5n CDI Kawasaki ER5 Twister.. 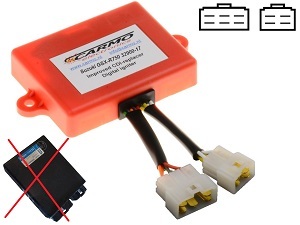 Improved Kawasaki GPx750 ZX750 CDI Replacer 21119-1204 / J4T01290 Plug&Play For: Kawasaki GPX750 CDI Kawasaki GPX750R CDI Kawasaki ZX750F CDI On.. 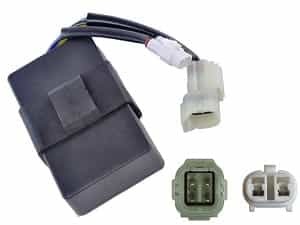 Improved Kawasaki GPz1000R ZX1000 CDI Replacer 21119-1164 21119-1165 Plug&Play For: Kawasaki GPZ1000R CDI Kawasaki GPZ1000RX CDI Kawasaki ZX1000.. 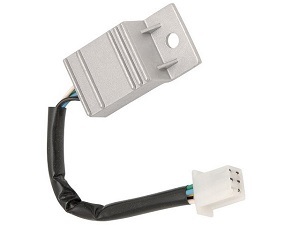 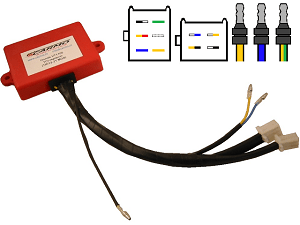 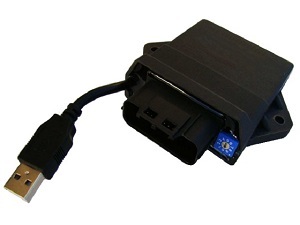 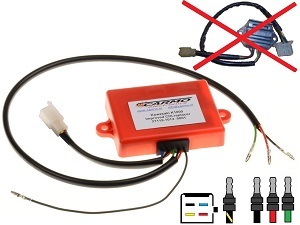 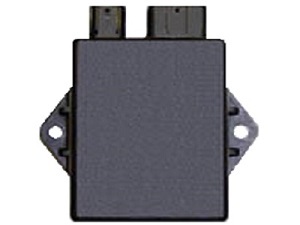 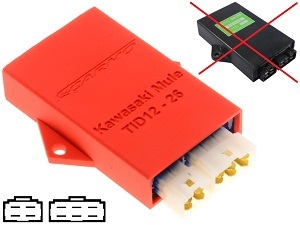 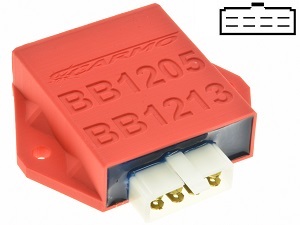 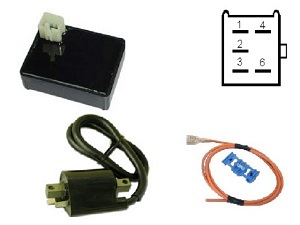 Improved Kawasaki GPz250R CDI Replacer 21119-1172 Plug&Play For: Kawasaki GPZ250R On the box: 21119-1172 J4T01273 Other names: EC Ignitor, brain,. 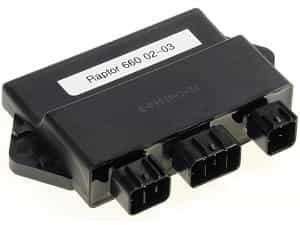 Improved Kawasaki GPz550 ZX550 CDI Replacer 21119-1113 Plug&Play For: Kawasaki ZX550 CDI Kawasaki GPz550 CDI Kawasaki Z550LTD CDI Kawasaki LTD550. 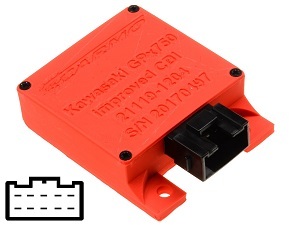 Improved Kawasaki GPz750 Z750 CDI Replacer 21119-1119 Plug&Play For: Kawasaki Z750 Turbo CDI Kawasaki ZX750E CDI Kawasaki GPz750 CDI 1984 1985 On. 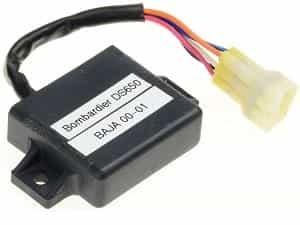 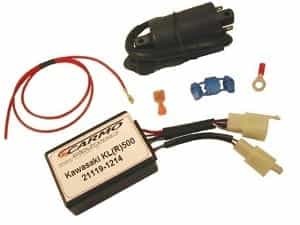 Improved Kawasaki KLR250 CDI replacer (21119-1180) Plug&Play For: Kawasaki KL250 CDI Kawasaki KLR250 CDI 1985 1986 1987 1988 1989 1990 1991 1992.. 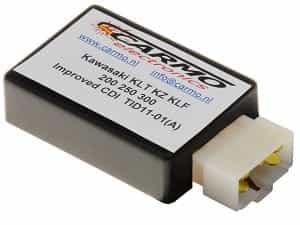 Improved Kawasaki KLT200 KLT250 Z250 KZ250 KLF300 CDI-box replacer TID11-01 TID11-01A Plug&Play For: Kawasaki KLT200 CDI Kawasaki KLT250 Prairie.. 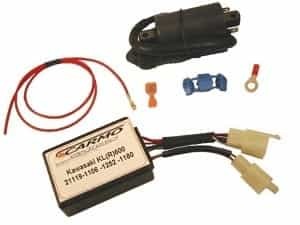 Improved Kawasaki KLX250 Replacer (21119-1381, 21119-1399) AMP Your bike will perform better with this advanced ignition unit from Carmo electronics!. 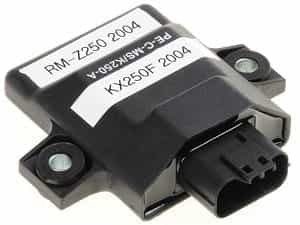 Improved Kawasaki Z400 Z550 Z650 Z750 CDI Replacer 21119-1020 Plug&Play For: Kawasaki Z400 CDI IC ignitor Kawasaki Z400J CDI IC ignitor Kawasaki.. 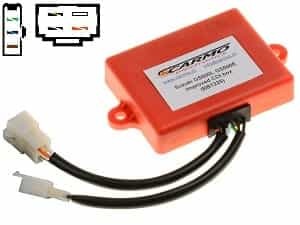 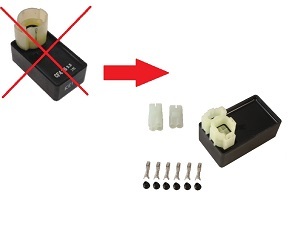 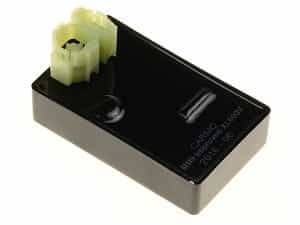 Improved Kawasaki KZ550 KZ650 KZ750 KZ1000 CDI Replacer 21119-1017, 21119-1040, 21119-1429 Plug&Play For: Kawasaki KZ550D CDI Kawasaki GPz550 CDI. Improved Kawasaki VN1500 Vulcan Classic CDI Replacer J4T07171 and J4T08771 Plug&Play For: Kawasaki VN1500-D1 Vulcan 1500 Classic IGNITION SYSTEM.. 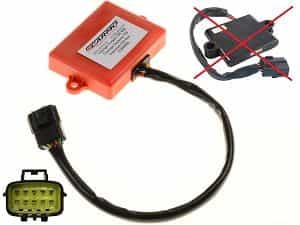 Improved Kawasaki VN500 Vulcan EN500 CDI TCI igniter (21119-1219) 3 Year warranty Plug&Play For: Kawasaki VN500 Vulcan CDI igniter Kawasaki EN500. 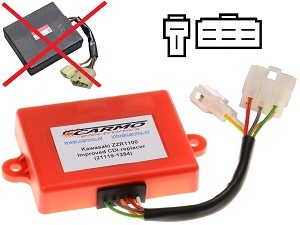 Improved Kawasaki Z1000 Z1000MK2 Z1000ST CDI Replacer 21119-1013, 21119-5001 Plug&Play For: Kawasaki KZ1000-A1 CDI Kawasaki KZ1000-B1 KZ1000 LTD.. 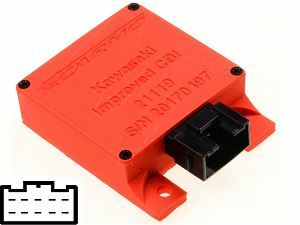 Improved Kawasaki Z400 Z440 Z750 Z1000 CDI Replacer SH347 Plug&Play For: Kawasaki KZ400 CDI Kawasaki 440LTD CDI Kawasaki KZ440 CDI Kawasaki KZ440. 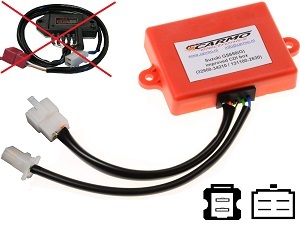 Improved Kawasaki ZX6R TCI Replacer (21119-1433, J4T05471, 21119-1570) AMP Your bike will perform better with this advanced ignition unit from Carmo.. 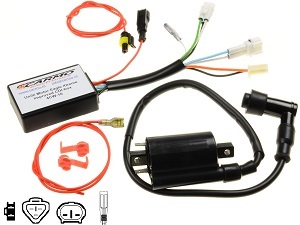 Improved Kawasaki ZXR750 CDI Replacer 21119-1365, J4T04072, 21119-1363, J4T04071 Plug&Play For: Kawasaki ZXR750 CDI Kawasaki ZXR750L CDI Kawasaki. 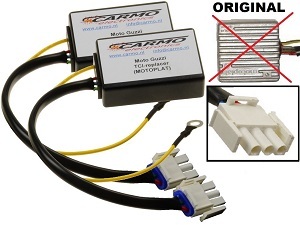 Improved Motoplat CDI-unit for a Moto Guzzi V65 Florida (2x) Plug&Play 3 Year warranty Your bike will perform better with this advanced ignition.. 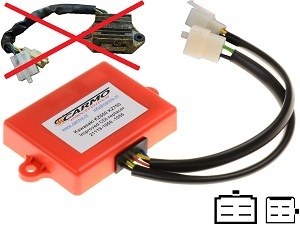 Improved Suzuki DR250 DR250S CDI replacer BM5102 32900-38210 32900-38220 3 year warranty Plug&Play For: Suzuki DR200 CDI Suzuki DR250 CDI Suzuki.. 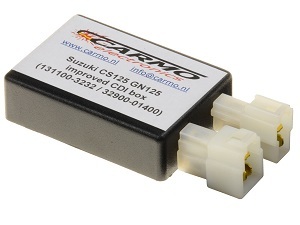 Improved Suzuki GS1100 GSX1100 GS1150 CDI Replacer Plug&Play For: Suzuki GSX1100 CDI Suzuki GSX1100ES CDI Suzuki GSX1100EF CDI Suzuki GS1150 CDI.. Improved Suzuki GS250 GS450 GS550 CDI ignition box (32900-47020, BB1201) 3 year warranty Fits: Suzuki GS250 1980 1981 Suzuki GSX400E 1980 1981 Suzuki. 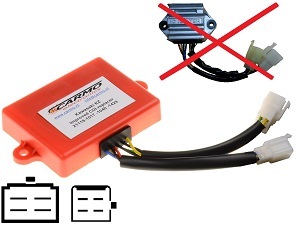 Improved Suzuki GSX400 GS400 GS500 GS550 CDI igniter BB1203 BB1204 3 Year warranty Plug&Play Replacer for: Suzuki GSX400F Katana CDI igniter 1981. 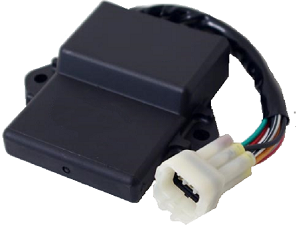 Improved Suzuki GS500L CDI ignition (BB1225) Plug&Play 3 year warranty For: Suzuki GS500 CDI ECU Suzuki GS500E CDI ECU Suzuki GS500L CDI ECU 1989. 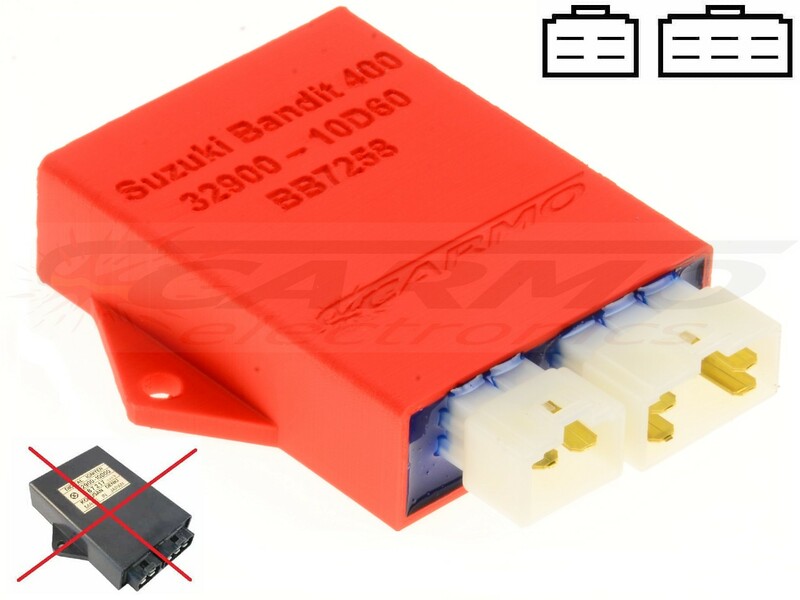 Improved Suzuki GSF400 CDI Replacer BB7205 / 32900-34C10 Plug&Play For: Suzuki GSX400F CDI On the box: BB7205 32900-34C10 digital igniter KOKUSAN. 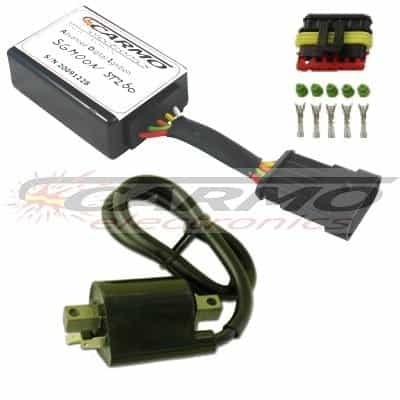 Improved Suzuki GSX550 TCI Replacer (32900-43400) AMP Your bike will perform better with this advanced ignition unit from Carmo electronics! 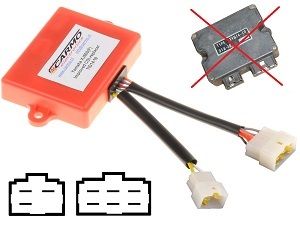 Improved. 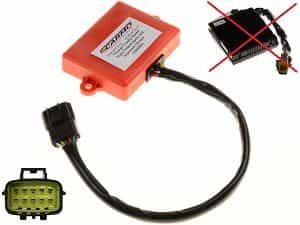 Improved Suzuki GSXR750 CDI ignition (32900-27A00) Plug&Play 3 year full warranty For: Suzuki GSXR750 Hypersport CDI ECU Suzuki GSX-R 750 CDI ECU. 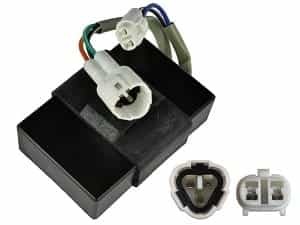 Suzuki GV1400 Cavalcade improved CDI/TCI Unit Ignition Module Cavalcade 3 Year warranty PLUG&PLAY For: Suzuki GV 1400 Cavalcade CDI Suzuki.. 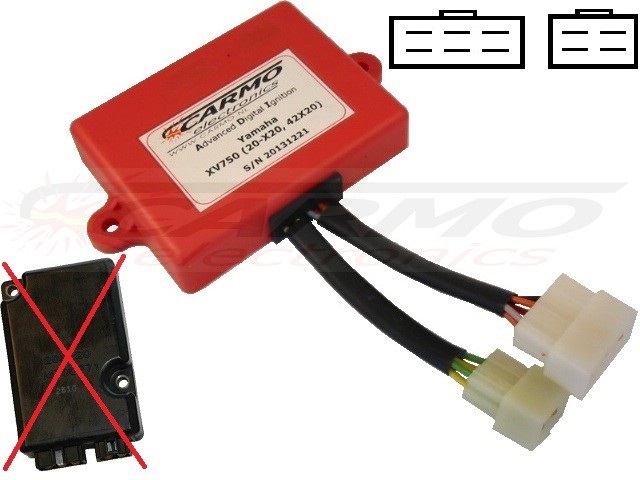 Improved Suzuki SV650S Replacer (BB7708, BB7709) AMP Your bike will perform better with this advanced ignition unit from Carmo electronics! 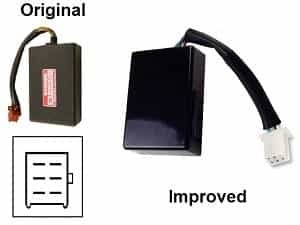 Improved.. 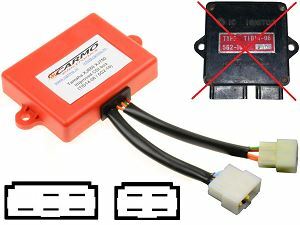 Improved Suzuki VS1400 Intruder CDI Replacer J4T02771 and J4T02772 Plug&Play For: Suzuki VS1400 Intruder CDI Suzuki VS1400GLPS Intruder CDI 1987.. 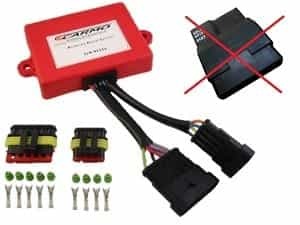 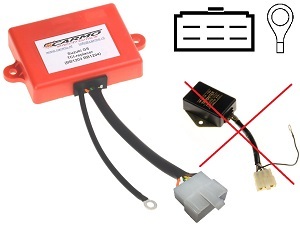 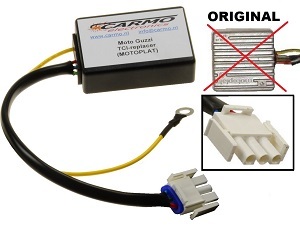 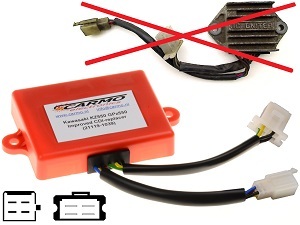 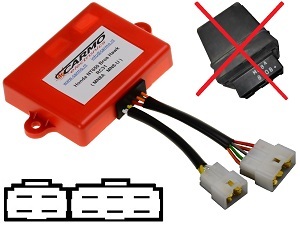 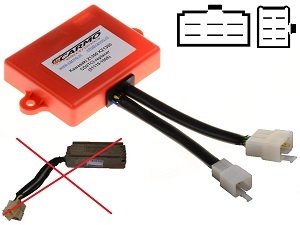 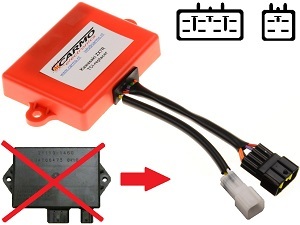 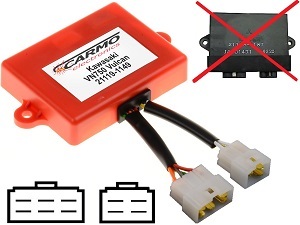 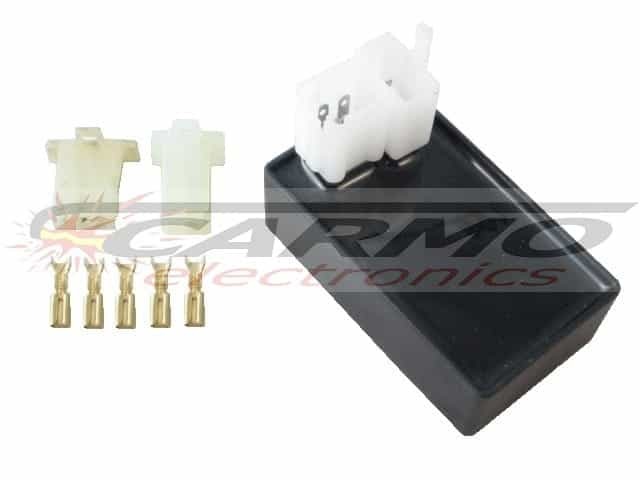 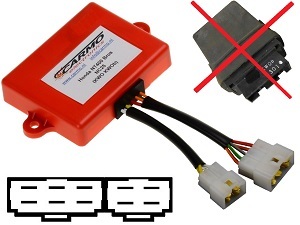 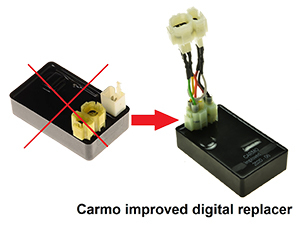 Improved Suzuki VS700 Replacer (131100-4630 / 131100-4631) AMP Your bike will perform better with this advanced ignition unit from Carmo electronics!. 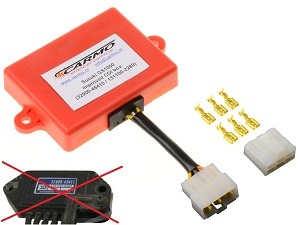 Improved Suzuki VS800 (32900-38A10, 131800-5061) AMP Your bike will perform better with this advanced ignition unit from Carmo electronics! 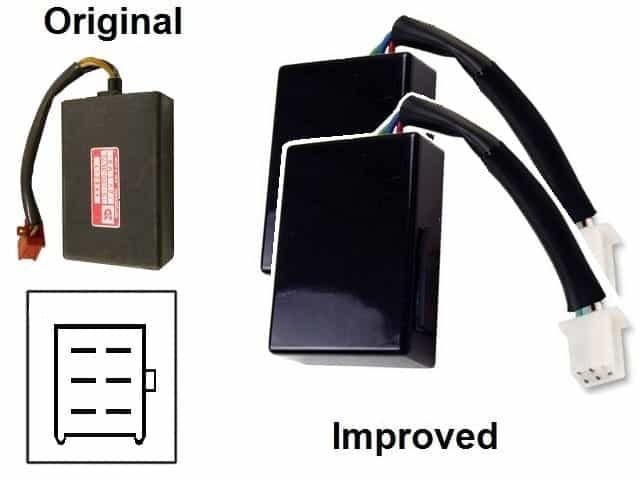 Improved.. 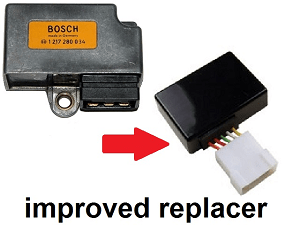 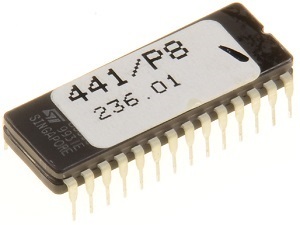 Improved TGB-400 TGB-425 TGB-450 TGB-500 TGB-525 Target Blade CDI Replacer TM01286 3 Year Warranty! 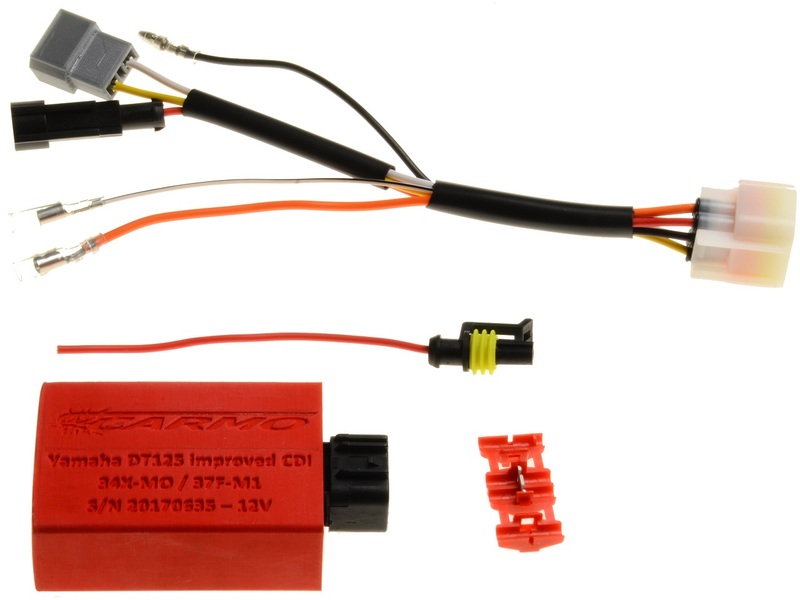 Plug&Play For: TGB BLADE 400 CDI igniter. 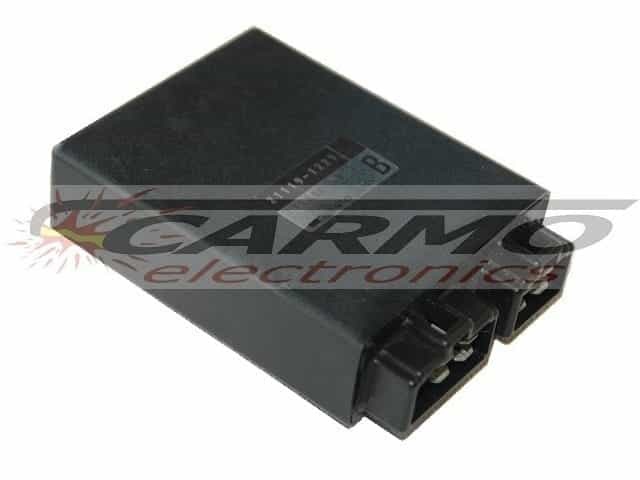 Amélioré Triumph 900 Super III CDI (T1290062 / 1290062) PLUG&PLAY - Garantie de 3 ans - pour: Triumph 900 Super III CDI Triumph T3..
Amélioré Triumph Bonneville CDI (T1292365, 1292365) Amélioré Triumph Truxton CDI (T1292365, 1292365) - Garantie de 3 ans..
Amélioré Triumph Bonneville CDI (T1292950, 1292950) Amélioré Triumph Truxton CDI (T1292950, 1292950) - Garantie de 3 ans..
Amélioré Triumph Scrambler CDI (T1292960, 1292960) - Garantie de 3 ans - Plug&Play pour: Triumph Scrambler CDI igniter - 2006 2007..
Amélioré Triumph Speedmaster CDI (T1292060, 1292060) - Garantie de 3 ans - Plug&Play pour: Triumph Speedmaster CDI igniter -. 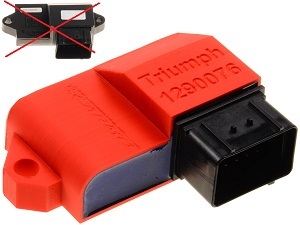 Amélioré Triumph Tiger 900 CDI (T1290061 / 1290061) PLUG&PLAY - Garantie de 3 ans - pour: Triumph Tiger 900 900HT CDI Triumph Tiger. 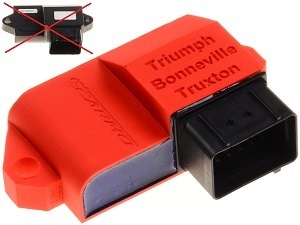 Amélioré Triumph Trophy 1200 CDI (T1290072 / 1290072) PLUG&PLAY - Garantie de 3 ans - pour: Triumph Trophy 1200 CDI igniter Triumph. 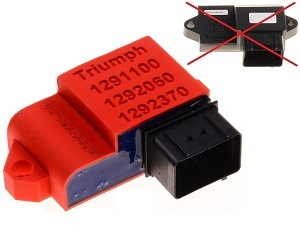 Amélioré Triumph Trophy 900 CDI (T1290083 / 1290083) PLUG&PLAY - Garantie de 3 ans - pour: Triumph Trophy 900 CDI igniter Triumph 3. 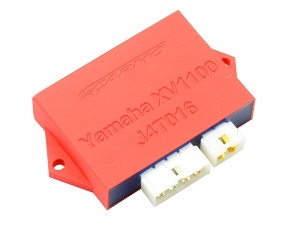 Improved Yamaha XJ700 Maxim CDI igniter (TID14-44 / TID14-47) 3 Year warranty Plug&Play For: Yamaha XJ700 (YSCB11) CDI igniter Yamaha XJ700 Maxim. 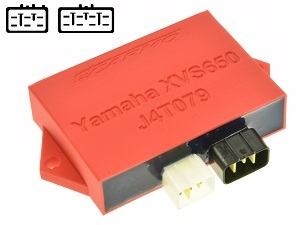 Improved Yamaha XJ700X Maxim CDI igniter TID14-35 3 Year warranty Plug&Play For: Yamaha XJ700X CDI igniter Yamaha XJ700X Maxim X CDI igniter 1985. 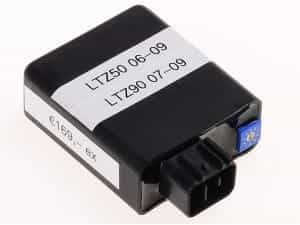 Improved Yamaha XJ750 XJ750F CDI igniter TID14-21 3 Year warranty Plug&Play For: Yamaha XJ750 CDI igniter Yamaha XJ750F CDI igniter Yamaha XJ750.. 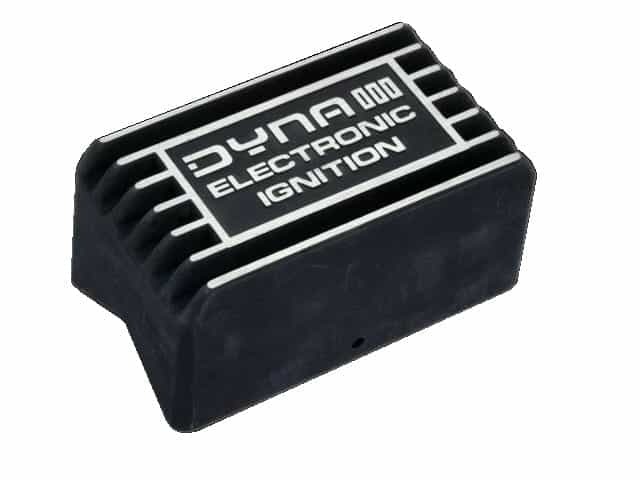 Improved Yamaha XJ900 (seca) CDI igniter TID14-37 3 Year warranty Plug&Play For: Yamaha XJ900 CDI igniter Yamaha XJ900 4BB CDI igniter 1985 1986.. 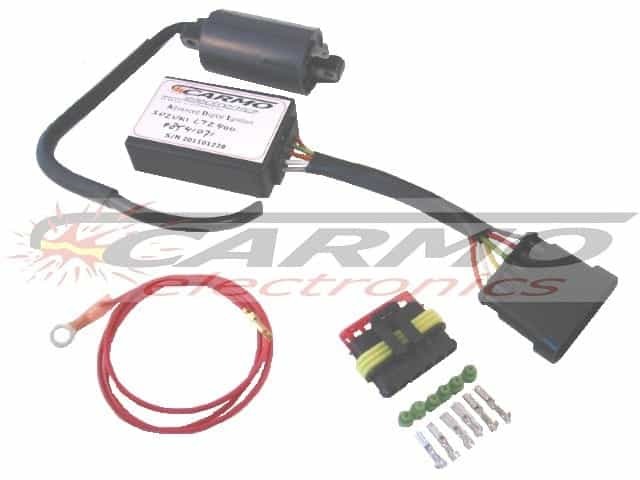 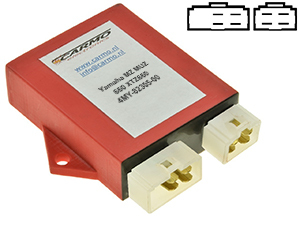 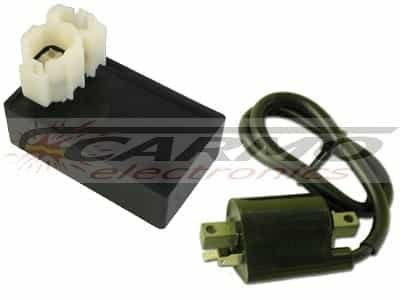 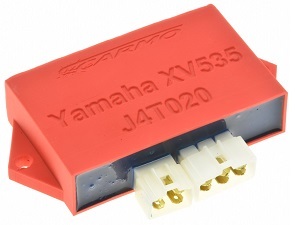 Improved Yamaha XJR1300 Replacer (5EA-20) AMP Your bike will perform better with this advanced ignition unit from Carmo electronics! 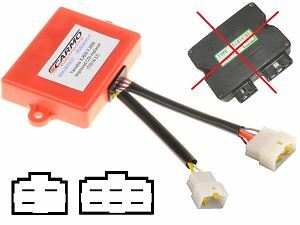 Improved version. 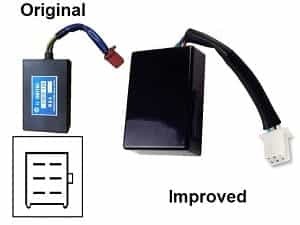 Improved Yamaha XS650 CDI Replacer TID12-03 Plug&Play 3 Year warranty Also: Yamaha XS650 CDI Yamaha XS650SJ CDI Yamaha XS650SK CDI Numbers on the. 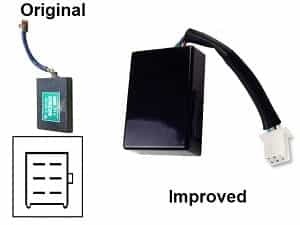 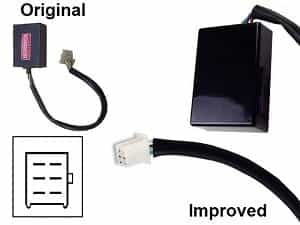 Improved Yamaha XV1000 Virago CDI replacer J4T01171 3 Year warranty Plug&Play For: Yamaha XV1000 Virago CDI Yamaha XV 1000 Virago CDI On the box:. 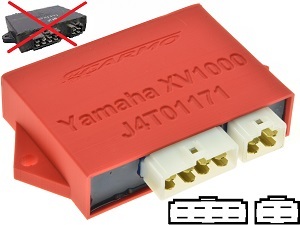 Improved Yamaha XV1100 CDI Replacer J4T016 3 Year warranty Plug&Play For: Yamaha XV1100 Virago CDI Yamaha XV 1100 Virago CDI 1986 1987 1988 1989.. 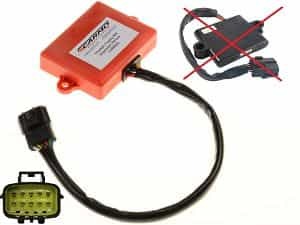 Improved Yamaha XV500 Virago CDI-box igniter 22U-20 / J4T01071 3 Year warranty Plug&Play For: Yamaha XV500 CDI igniter Yamaha XV500K CDI igniter.. 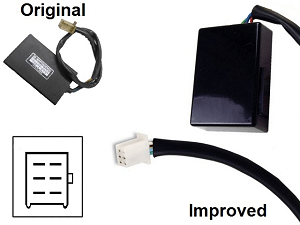 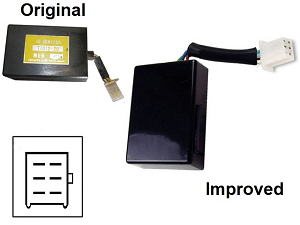 Improved Yamaha XV700 XV750 XV920 CDI-box igniter J4T00871 / 20X-20 Plug&Play 3 Year warranty For: Yamaha XV700 Virago CDI igniter ECU ECM Yamaha. 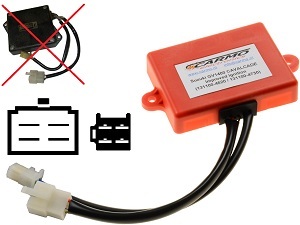 Improved Yamaha XVS650 Dragstar V-star CDI Replacer J4T079 3 Year warranty Plug&Play For: Yamaha XVS 650 Dragstar Classic VM02 CDI Yamaha XVS650.. 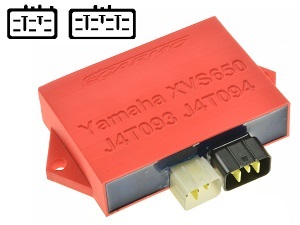 Improved Yamaha XZ550 CDI replacer TID12-06 11H-10 Plug&Play For: Yamaha XZ550 CDI Yamaha XZ550 Vision CDI Yamaha XZ550RJ CDI Yamaha XZ550RK CDI.. Improved Yamaha FZ600 YX600 Radian CDI igniter TID14-48 / 1UJ-10 3 Year warranty Plug&Play For: Yamaha FZ600 CDI igniter Yamaha YX600 Radian CDI.. Improved DIgiples 2S unit Please, put your original unit number in the comment box when you order. 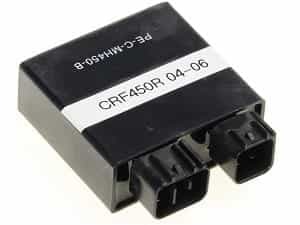 (For example MED 441A, MED442A, MED446A, MED500A,.. 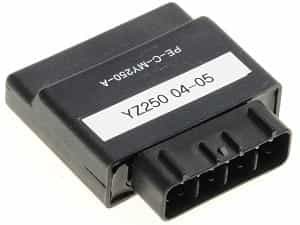 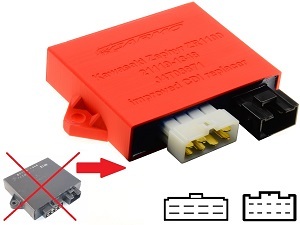 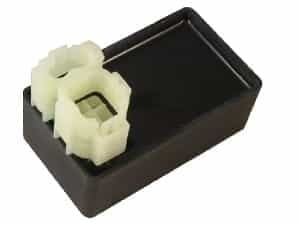 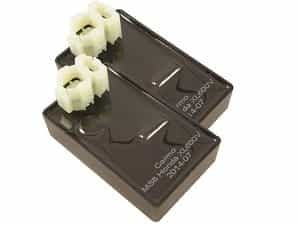 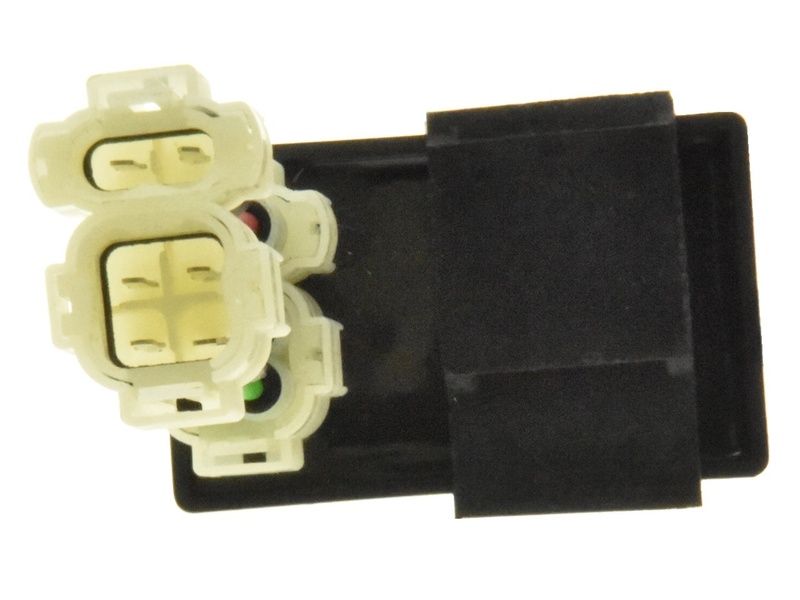 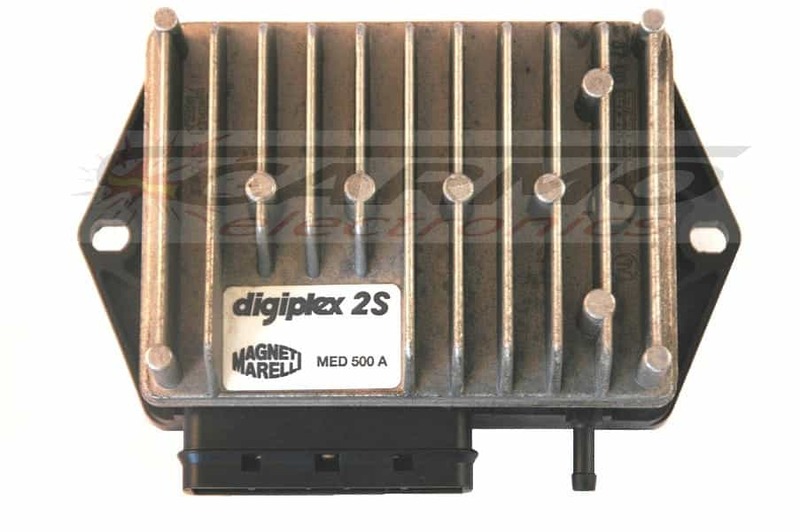 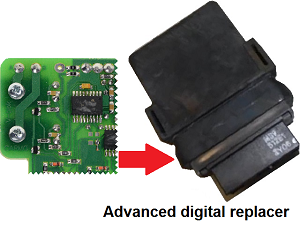 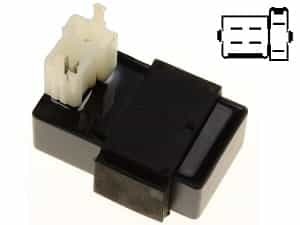 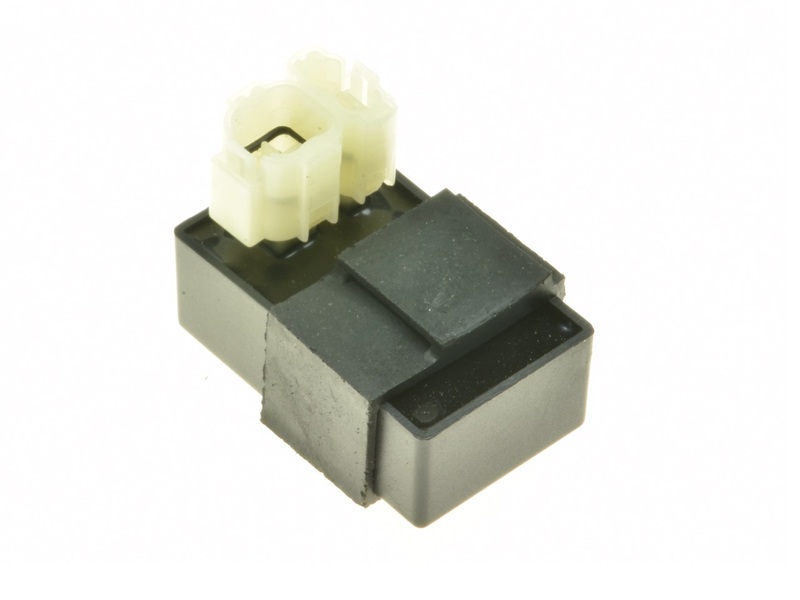 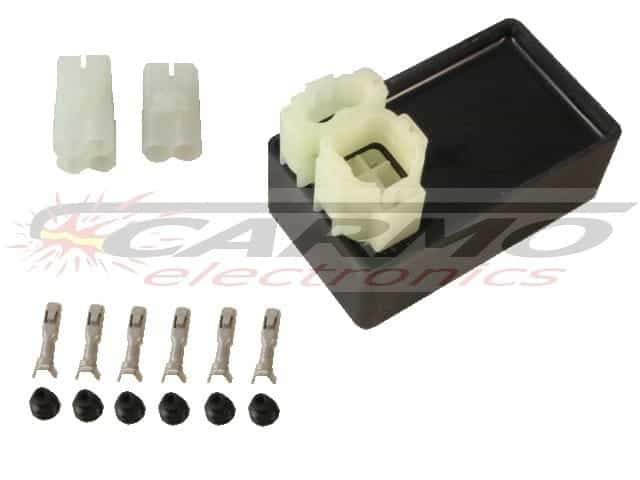 This is a improved digital Honda XL600v transalp MM9 CDI unit Plug&Play Warranty 3 years -- It is important that ‘MM9’ is printed on..
Digital Replacer unit For: Honda VF750 CDI Honda VF750C CDI Honda VF750CD CDI Honda VF750C2 CDI Honda VF750CR RC43 CDI 1994 1995 1996 1997 1998 1999.. Improved Kawasaki Zephyr (ZR1100) CDI box For: Kawasaki ZR1100 Zephyr CDI Kawasaki ZR1100-A1 ZR1100 Zephyr IGNITION SYSTEM Kawasaki ZR1100-A2 ZR1100..
Advanced improved Honda RT5000 / Honda H5013 replacer CDI unit (CF518) Plug&Play 3 year warranty OEM: 30580-ZE3-790 Honda Code: 2556827 - Spark.. 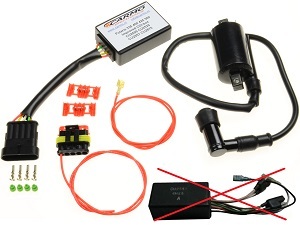 Improved new CDI with advance for Honda XR600R XL600R Plug&Play - Spark Advance from 1500TPM - Maximum advance at 3750TPM - Smooth advance, not a. 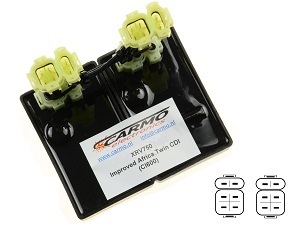 Advanced improved Sym Wolf 125cc CDI amélioré sans limiteur de régime Plug&Play 3 year warranty - Spark Advance from 2000TPM.